Looking forward to explore the wildlife and nature? Safariline Defender Tours is inviting you to an ultimate and breathtaking safari tour in Kenya. You will get to experience four of the best premier game reserves in Kenya, which known as Masai Mara, Lake Naivasha, Lake Nakuru, and Amboseli. Moreover, you will get to enjoy wildlife viewing and wonderful spectacle of pink flamingos at Lake Nakuru. During this safari tour, you will be staying overnight in several camps at Masai Mara and Amboseli National Park. While you are at Naivasha and Lake Nakuru, you will be staying in budget hotels. You will be pick-up from the hotel at 8 a.m., then transfer to office and depart to Masai Mara Game Reserve through the view-point of the Great Rift Valley. Also, you will be having lunch at Narok town. On arrival, the group will proceed to a game drive to track various animal species and birds with the driver or guide. After that, the group will return for dinner and overnight at the campsite. After breakfast, the group will proceed on a full-day game viewing within the reserve. The landscape of the reserve is scenic savannah grassland on rolling hills, it is the best park for game viewing in Kenya. Moreover, it has an extensive road and track network which allows close range viewing and photography. Moving on, the group will take a break to enjoy picnic lunch at the hippo pool as well as looking out for hippos and crocodile. After that, the group will return for dinner and overnight at the campsite. Today, you will go on an early morning pre-breakfast game drive. After breakfast, the group will depart the Mara region to Lake Naivasha. You will arrive during the late afternoon and have lunch en-route. Moreover, there is an optional boat ride with additional cost. Moving on, the group will enjoy dinner and overnight at the budget hotel. Breakfast tour at the Hell’s Gate National Park, the park has attractions such as the Olkaria and Hobley's. It is an extinct volcanoes and the obsidian forms from the cool molten lava. In addition, within Hell's Gate is the Hell's Gate Gorge. It is lined with red cliffs which contains two volcanic plugs, known as Fischer's Tower and Central Tower. It is a smaller gorge that extends to the south and of which a path descends into hot springs. Moving on, the group will depart to Lake Nakuru and arrive on time for an evening game viewing. Lake Nakuru is referred as pink lake and it is a bird watchers paradise, as there are thousands of pink flamingos and other bird life in the park. Furthermore, it has a surprising number of animals, a rhino sanctuary, and the big five except the elephant can be seen here during afternoon game drive. After that, the group will enjoy dinner and overnight at the budget hotel. After breakfast, the group will proceed on a game drive in Lake Nakuru Park. The park is known for its prolific bird life including flamingos. It also contains a sanctuary for the conservation of white rhino. Moreover, species like the cape buffalo and waterbuck can be seen near the shoreline as well. After that, the group will journey to Amboseli National Park. Moving on, the group will enjoy dinner and overnight at the campsite. Today will be a full-day game drives at Amboseli National Park. The park contains swamp grounds in which elephants and hippos bathe in abundance. Moreover, there are also variety of plains game such as antelopes and birds that can be seen, as well as the Mount Kilimanjaro’s peak too if weather conditions permit. After that, you will be served with picnic lunch. Moving on, the group will return and overnight at the campsite. Today, you will go on an early morning game viewing. After that, the group will return to the camp to enjoy a full breakfast. The safari tour ends here, the group will journey back to Nairobi and you will be drop-off at Jomo Kenyatta International Airport (NBO) to connect flight home. 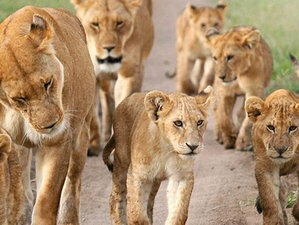 Throughout the tour, you will be visiting several places such as Maasai Mara National Reserve, Lake Naivasha, Lake Nakuru, and Amboseli National Park. The Masai Mara National Reserve is an area of preserved savannah wilderness in southwestern Kenya, along the Tanzanian border. Moreover, Lake Naivasha is a freshwater lake in Kenya. It is located outside the town of Naivasha in Nakuru County and lies north west of Nairobi. Lake Nakuru is one of the Rift Valley soda lakes and it lies to the south of Nakuru in the rift valley of Kenya. As for Amboseli National Park, it is located in southern Kenya, the park is known for its large elephant herds and views of the immense Mount Kilimanjaro, across the border in Tanzania. In this safari tour, you will be served with six breakfasts, six lunches, and six dinners. During this retreat, there are other activities that is available for you to enjoy at additional cost. For instance, you can go on a boat ride at Naivasha and/or visit the Masai village. Please book your flights to arrive at Jomo Kenyatta International Airport (NBO). Transfer from this airport is included. Safariline Defender Tours will pick you up at the airport. Airport: Jomo Kenyatta International Airport Airport transfer included: Jomo Kenyatta International Airport No additional charges. You can request this in the next step. Safariline Defender Tours offers budget, camping, lodge, luxury tented camps safaris for individuals, groups, and family holiday in East Africa.